I love beetroot thoran. This is what I had for lunch today. So I get a photo opportunity and you get a new recipe. I also made potato mezhukkupuratti today so I could photograph that too and add it to my previous post. So here I embark on my new hobby of photography. Writing recipes was my only intention when I started writing this blog. I am absolutely new to the world of blogging. I was quick to realize photographs were of immense importance. For my first recipe post I copied an image from the image search and that sure left me with a bad taste in my mouth. So here are my very first on food photography. Personally, I like the potato sauté pictures better. Back to our beetroot thoran, this is a delicious stir fry made using beetroot and coconut. It makes a great combination with hot rice and yellow moru curry. Basic thoran recipe is the same. Beets are loaded with vitamins A, B1, B2, B6 and C. They are also an excellent source of calcium, magnesium, copper, phosphorus, sodium and iron. 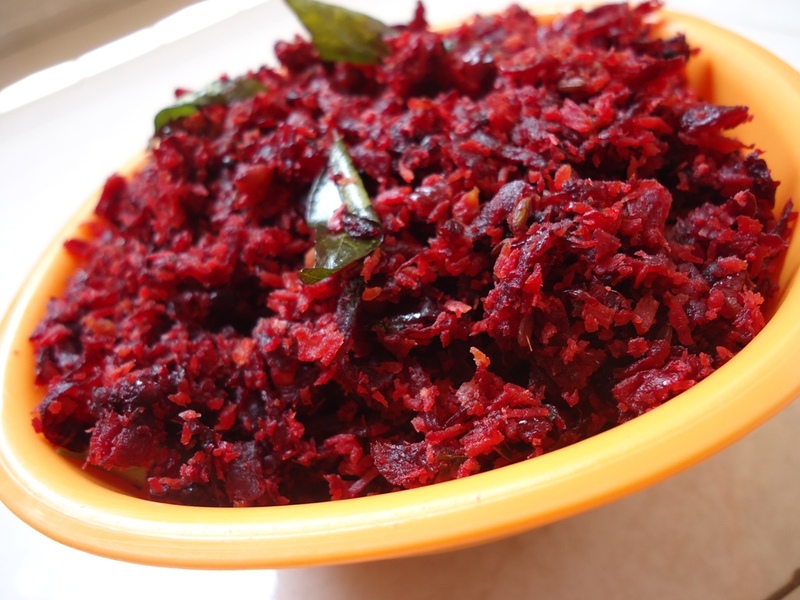 Shred the beetroot as finely as possible. 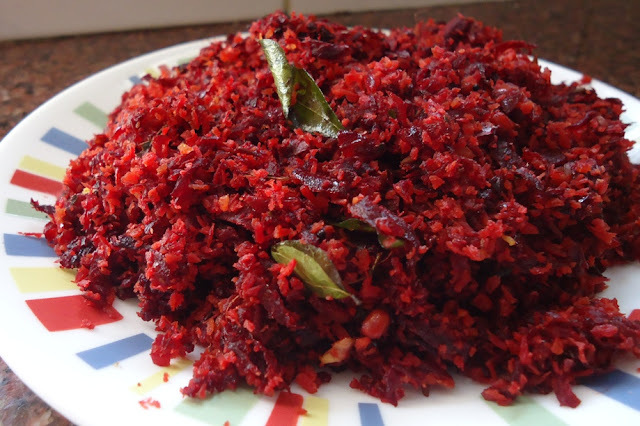 Add the beetroot, ground masala and salt. Toss well. Sprinkle a little water. Cover and cook on low fire, stirring occasionally to prevent from sticking and burning. About 10-12 minutes.